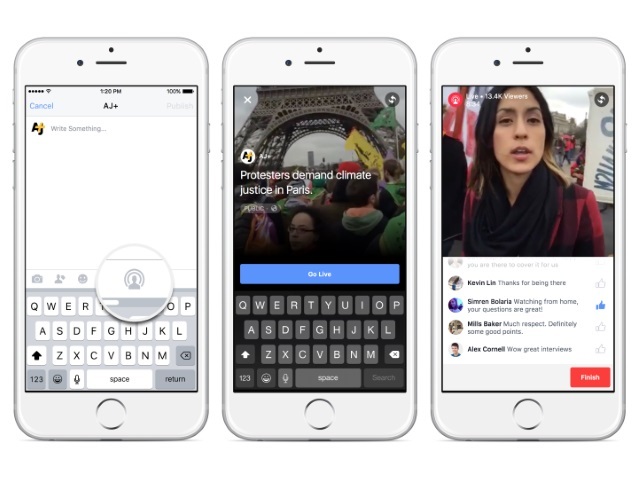 Live-video-streaming feature Live for Facebook Mentions is no longer limited to Facebook Mentions, as the social network announced that the iOS feature has been extended to all verified pages. Facebook introduced Live in August for users of its Facebook Mentions application for public figures, celebrities and journalists. The social network has been testing Live with some verified pages, and examples are embedded below from The Tonight Show Starring Jimmy Fallon, U2, The White House and Real Madrid. To share live video, go to your page on Facebook for iOS and tap publish. Select live video and write a quick description before going live. During your broadcast, you’ll see the number of viewers, the names of other verified people or pages who are tuning in and a real-time stream of comments. When you end your broadcast, it will be published on your Timeline so that fans who missed it can watch the video at a later time, although you have the option to remove it just like any other post. People who like your page can discover your live videos in News Feed and through notifications on Facebook. While watching a live video, people can tap the subscribe button to get notified the next time your page goes live. The social network also pointed users to a best practices page for Live. Verified page admins: Ready to get started?